Adventure travel clothing company Rohan has just launched its Spring and Summer 2003 catalogue and its packed with ground breaking technology and clever designs. The emphasis is on lightweight and this is very much in evidence in the new waterproof Cloudcover jacket (pictured top right). Rohan claims it is the lightest high-performance travel waterproof in the world, weighing in at a measly 350g. The secret is the innovative laminating process used in the manufacture of the fabric. The outer fabric, a durable polyamide, is given a microporous coating, then a hydrophilic laminate and, finally, a protective hydrophilic coating. 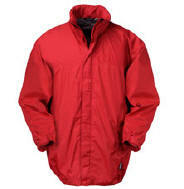 The last coating dispenses with the need for a lining saving vital weight and reducing the packed bulk of the jacket. The fabric exceeds all accepted standards of waterproofness several times over, offering a hydrostatic head of 15,000mm. To ensure the highest levels of breathability, the face fabric is treated with Rohan's Permanent Water Repellency process this extremely durable finish stops the surface of the top absorbing moisture, forces water to 'bead up' and prevents the fabric wetting out. This treatment has been proven to perform at 80% of its original capacity even after being washed 100 times. Features include a foldaway, fully-adjustable hood, two zipped hand pockets and adjustable cuffs and hem. The inside pocket doubles as a Packpocket for compact stowage. The Cloudcover is available in three colours - black, red and gunmetal - and sizes XS-XL. It costs £99. Also new to the range are the Double Convertible Essential Trousers (pictured bottom right) which offer three super light hiking trousers in one convenient package. You can wear them as long trousers, cut-off length breeches or shorts by simply zipping on or off the removable leg sections. The DC Essential Trousers weight just 350g a pair and the 100% polyamide fabric is blessed with Dynamic Moisture Control (DMC) for enhanced comfort and speed of drying. Features include pre-bent knees, a hidden security pocket, D-ring inside the hand pockets for keys, elasticated waist with fly and quick release integral belt. They cost £59 a pair, comes in two colours - cement and light gunmetal - and sizes S-XL. Look out too for Rohan's range of technical unisex T-shirts with DMC and fancy graphics at £35 a throw and long and short sleeved Trail Shirts at £39 and £45 respectively. For women, there's a new contemporary look travel jacket, the Longitude, with DMC and sun protection (£59), and the checked, fast-drying Tobago Shirt (£39). The new Rohan range is in shops from March 3, 2003. For more info, log on to www.rohan.co.uk or call 0870 601 2244 for a copy of the new catalogue.